My second day in Penang ended with a movie at GSC Gurney Plaza and a supper of Penang Hokkien Mee at 888 Hokkien Mee right after. 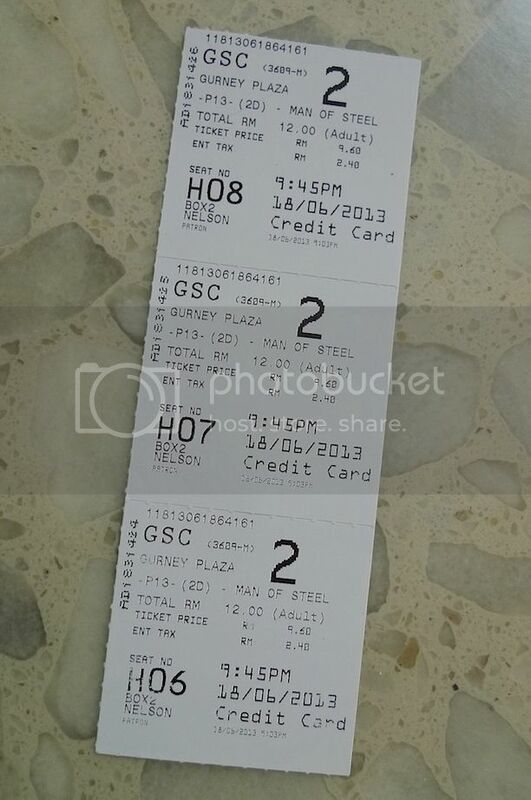 It was my first time going to a cinema in Penang. Guess what movie I watched together with bloggers Ken and Ann? It's Man Of Steel. In case you are new to my blog and are wondering how come the cinema was showing outdated movies, I just wanna let you know that this trip was made in the middle of last year, and I'm only blogging about it now. LOL! Man Of Steel was a pretty entertaining movie, but that's about it. Haha! After the movie, Ken drove us to 888 Hokkien Mee for supper. 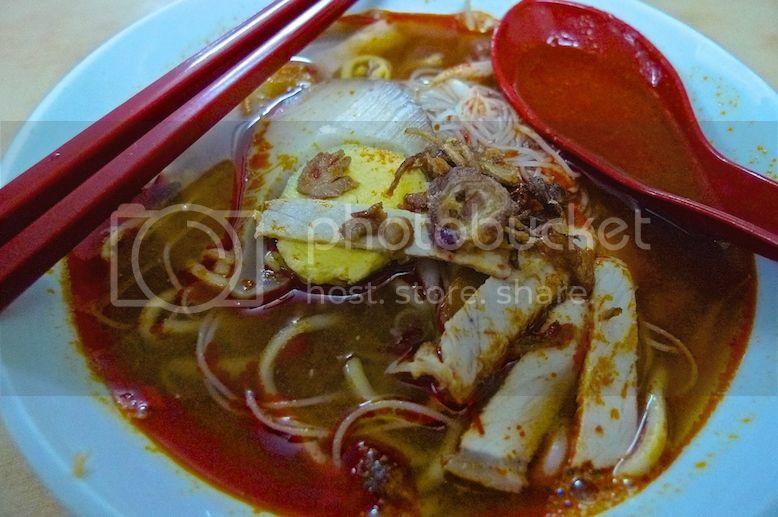 Located at Lebuh Presgrave, and a short distance from First Avenue Mall, this shop is famous for its Hokkien Mee! The Mandarin words stated the stall as 3rd Road 888 obviously referring to Lebuh Presgrave as 3rd Road (or Sah Tiao Lor in Hokkien). Remember the 7th Road (Chit Tiao Lor) where I had some delicious hawker food? No? Read HERE. We ordered Hokkien Mee, or more accurately Hokkien Prawn Mee. 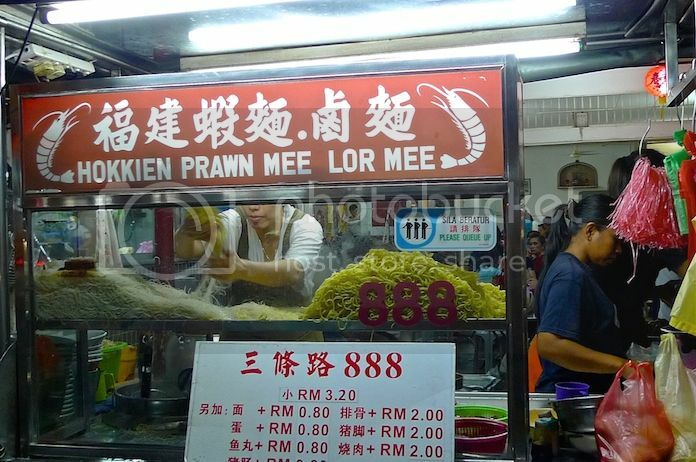 It is important to note the word 'prawn' there because the Hokkien Mee in Penang is totally different from the Hokkien Mee in KL. KL's Hokkien Mee is made up of thick yellow noodles braised in thick dark soy sauce with pork, squid, fish cake and cabbage and usually laden with cubes of crispy fried pork fat. The appearance is an all black noodles. Totally unhealthy but delicious dish! Whereas, Penang Hokkien Mee is basically egg noodles and rice noodles cooked in a soup base that is made from fresh shrimps and dried prawns as well as pork or chicken. You can usually find chicken or pork meat, prawns and eggs inside a bowl of Penang Hokkien Mee. It's also served with red chili paste. In KL, this type of noodles is better known as Prawn Mee (Har Mee). How did I like the Penang version of prawn mee? One word - Yummy!! The soup was very tasty and the chili paste added extra oomph to the Hokkien Mee. If I were to compare Penang's version of prawn mee with KL's prawn mee, Penang wins hands down. But KL's black Hokkien Mee is a totally different story and I love it as well, but I think Penang Hokkien Mee is much healthier, haha! 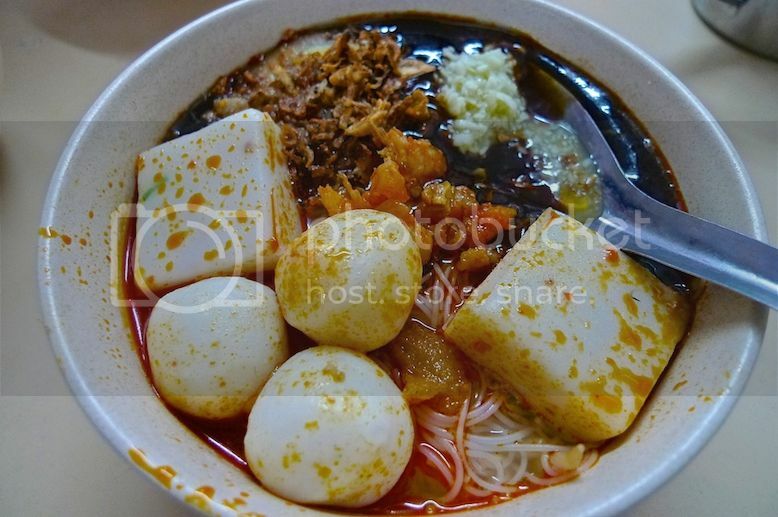 We also ordered a bowl of lor cham th'ng which is a combination of Lor Mee and Hokkien Mee. I did not remember eating this, so I cannot comment on it much. I guess Ken and Ann ate this one, while I ate more of the Hokkien Mee. Well, that means I would need to make another trip to Penang soon to try out this lor cham th'ng, right? I would also like to take this opportunity to thank Ken and Ann for being such good food tour guides!